Metro Manila – The Mariners System, thru its allied institutions, the Mariners Polytechnic Colleges Foundation (MPCF) in Legazpi City, Albay and in Canaman, Camarines Sur, the Mariners Polytechnic Colleges (MPC) in Naga City, The Mariners Polytechnic Training Centers (MPTC) in Metro Manila and Cavite, the Globalmanpower Management and Development Corporation and the UNLAD Ship Manning Management Corporation in the metropolis joins this activity as the world observes the International Day of Seafarers. Every 25th day of June, the maritime community celebrates the International Day of Seafarers. This event is observed to honor the men and women who work in this sector, to give them due recognition of their accomplishments and contributions to the seafaring profession, to business and to the well-being of people in the world. Almost half a million Filipinos work in this industry worldwide whether in Cruise Ships, Cargo Ships or Passenger Vessels and we in the Philippines have every reason to celebrate. This profession continues to contribute to the economy of the nation, enhancing the quality of lives of Filipino families and thereby contributing to nation building. Included in the event is the giving of honor to seamen who have perished in sea mishaps and other departed maritime workers who have left imprint to the maritime industry thru their tireless pioneering efforts which have made the maritime industry what it is today. The occasion also offers an opportunity for the governments of nations in the world to review the welfare of industry workers who man the ocean-going sea vessels. Without the seafarers, the world will not be as what it is today. In the realm of transporting bulk cargo, no other means can be as effective and less expensive as what the maritime system of haulage can offer. The Mariners System continues to push its advocacy to be the center of excellence when it comes to maritime education in the Bicol Region. Lately, an ultra-modern electronics and globally-connected Library for Safe Seafaring (L4SS), a grant given by the European-based Elsevier Foundation to the Mariners schools has been established. This makes a difference when it comes to the learning competence and research capabilities of our students and faculty; this is one of its kind when it comes to its being advanced. The school, it was confirmed, is the only recipient of this grant in the entire Southeast Asia from Elsevier. A speaker discusses the topic ‘Customer Relations’ before the Faculty and Staff of MPC-Naga at the Development Seminar Workshop held at the Mariners Training and Hotel Institute (MTHI). Seated (left to right) – Academic Dean Dr. Luz Martires, MPC-Naga President Dr. Marilissa J. Ampuan, EVP Dr. Gabriel L. Jimenez, Executive Assistant to the President Ely Alipante and Resource Speaker Ms. Bernadette Joy Salvador-Dychinco. Naga City – A Faculty and Staff Development Seminar Workshop was held the whole day on June 7, 2014 at the fourth floor of the Mariners Training and Hotel Institute (MTHI) of the Mariners Polytechnic Colleges (MPC) this city, to enhance the preparedness of the faculty and staff for the opening of the first semester of academic year 2014-2015. Included in the topics discussed were ‘Personality Enhancement’ and ‘Customer Satisfaction’. The first topic was taken-up in the morning which focused on how the personnel of the school should package and carry themselves so that they can project the right image of the institution they represent. 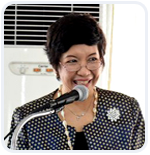 The Speaker was Ms. Caridad ‘Carrie’ Gomez-Aguirre, an entrepreneur and faculty member at the Ateneo de Naga University. In the afternoon, the subject ‘Customer Relations’ was discussed before the participants. In this session, the speaker hit on the theme that students, parents and the public comprise the ‘customers’ of the school. How a personnel relates with them is of utmost importance. Ms. Bernadette Joy Salvador-Dychinco, a non-governmental organization community organizer and public relation instructor was the invited speaker and lecturer. The participants pose for a souvenir photo with school officials after the seminar sessions were conducted at the Mariners Polytechnic Colleges in Naga City. Pasig City, Metro Manila – The Mariners Polytechnic Colleges (MPC) in Naga City sent four of its key personnel from the Hospitality and Tourism Departments to Astoria Hotel in Pasig City to attend training on Housekeeping and Food & Beverage preparation and handling. This was disclosed by MPC Naga Human Resource Department Head Ma. Hazel Palacio who said that the attendees stayed for five days, from May 12 to 17, 2014 in this five star hotel. It has been a tradition for the school to send from time-to-time its key personnel representing the different departments especially during semestral or summer breaks to give them the chance to enhance their capabilities when it comes to the latests in the subjects they teach. The school delegation was led by Hotel and Restaurant Management (HRM) Department Head Ms. Adelpa Phan, and other members of the staff composed of Ms. Jeanette Angie Amaro, Ms. Sandra Bueza and Ms. Emmie Barroza. Since the establishment of the five-storey Mariners Tourism and Hotel Institute (MTHI), one of the priorities given attention by the school is the upgrading of the capability of its instructors especially in the hospitality and tourism courses which is complemented by the facilities found in the training hotel. With this development, Mariners Naga continue to prepare for the opening of the first semester of Academic Year 2014-1015.